Tim LaHaye, well-known evangelical leader and co-author of the Left Behind series, went home to be with the Lord on July 25, 2016, after suffering a stroke. Dr. LaHaye was instrumental in the start of the Institute for Creation Research and served on its Board of Trustees for many years. In September 1970, he invited Dr. Henry Morris, then head of an engineering department at Virginia Tech, to move to San Diego to help with the founding of Christian Heritage College (now San Diego Christian College). ICR was a division of the college for a decade before forming its own ministry of researching the science that supports the accuracy and authority of the Bible. The following is adapted from ICR’s upcoming book Henry M. Morris: Father of Modern Creationism. Henry Morris saw that the only way to have a genuine creationist school and research center would be to establish one himself. He traveled to the Torrey Conference at Biola College in January 1970 for what turned into a divine appointment with Dr. Tim LaHaye. Consequently, Henry Morris made a decision that took him to San Diego to start a new ministry—one that required a lifelong commitment. He joined Dr. LaHaye and Dr. Art Peters in California where these two pastors hoped to start a Bible college modeled after Bob Jones University. Dr. LaHaye was well-known for his books, but neither pastor had experience in education or developing plans for curriculum or faculty. His far-reaching vision struck a responsive chord with LaHaye and Peters. They named the new liberal arts school Christian Heritage College. Dr. Morris assumed the role of Vice President for Academic Affairs and also served as Director of the Creation Research Science Center, a division “dedicated to restructuring all fields of learning and practice in the integrating framework of genuine creationism.”2 Art Peters served as executive Vice President and Tim LaHaye the President. Classes began in the fall of 1970. Within a few months, the success of Acts & Facts encouraged many donors to get involved, and ICR became essentially self-supporting. In the next few years, many talented scientists and researchers connected with ICR, either serving full-time or contracting for various college courses, special projects, or as speakers. ICR’s activities revolved around literature, research, and teaching. ICR staff and other creation scientists were producing so many books, pamphlets, articles, and textbooks that Henry Morris and others determined to start a publishing company dedicated to the creation and apologetics genre. Named Creation-Life Publishers, the company produced books on creation and those from LaHaye’s Family-Life Seminars. Tim LaHaye went on to serve as a Board member to ICR until 2007. He continued to be a friend to our ministry, even speaking at ICR’s 25th anniversary celebration in Washington, D.C. Through Dr. LaHaye’s work with Dr. Morris, countless people have heard the evidence that the Bible is true and authoritative in everything it says. We are profoundly grateful for the influence of this godly man. Morris, H. M. 1997. Contending for the Faith. Unpublished manuscript, 172. Morris, H. M. 1985. ICR - Fifteen Years in a Unique Mission 1970-1985. Acts & Facts. 14 (9). Morris, H. M. 1984. A History of Modern Creationism. San Diego, CA: Master Book Publishers, 236. Image Credit: Copyright © 2013 Liberty University. Adapted for use in accordance with federal Copyright (fair use doctrine) law. Usage by ICR does not imply endorsement of copyright holder. Cite this article: Staff Writer. 2016. 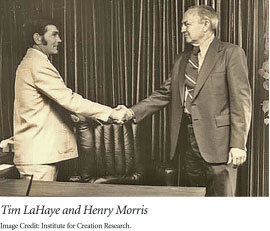 Tim LaHaye and the Institute for Creation Research. Acts & Facts. 45 (9).